Usain Bolt Is Knocked Over By Segway-Riding Cameraman After Winning Gold : The Two-Way The incident happened at the World Athletics Championships, where a highly anticipated match-up had pitted the Jamaican against America's Justin Gatlin. Usain Bolt of Jamaica is hit by a cameraman on a Segway while celebrating his win in the 200-meter final during the 15th IAAF World Championships at National Stadium in Beijing. 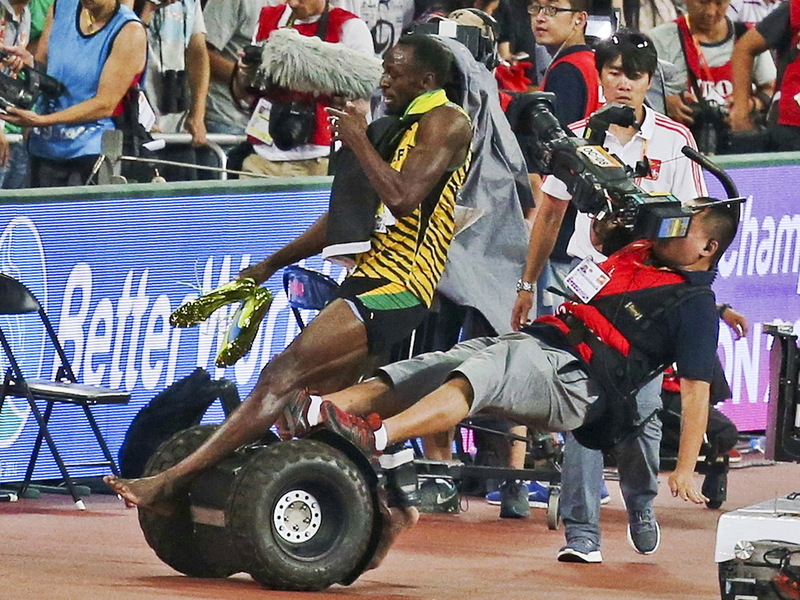 For elite Jamaican runner Usain Bolt, Thursday's 200-meter sprint was like many other races he's won — until a mobile cameraman lost control of his Segway and took the world's fastest man down from behind. Bolt, who had been waving to the crowd, collapsed in a heap. He had been walking barefoot on the track. The incident happened at the World Athletics Championships, where a highly anticipated match-up pitted Bolt against American Justin Gatlin. The Jamaican superstar won in style, posting his fastest time of the year, with 19.55 seconds. Gatlin trailed at 19.74. In the 100-meter race on Sunday, Bolt had edged Gatlin by an even narrower margin: 0.01 second. But it was Bolt's clash with the cameraman that generated even more discussion than his fourth consecutive world championship in the 200. After the fall, he quickly got to his feet and walked quickly — but gingerly — away from the cameraman. Bolt, 29, didn't mention the incident during a post-race interview. On Twitter and Instagram, he focused on his win, which came after months of concerns about his fitness: "They said it couldn't be done.. But my peeps even when they tell you that all the odds are against you never give up.. Fight on and keep believing in your God ability." One comment responding to that post read, "But never trust the cameramen!!"